Celebrate the two-year-olds in your life with this perfect second-birthday gift! You're one plus one, and that makes two! 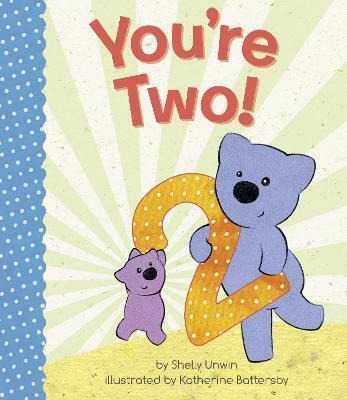 In this lively and fun-filled board book celebrating the number two, toddlers and their favorite grown-ups will enjoy finding all the ways in which number two is special: two eyes to see, two ears to hear, two arms for cuddling, and two thumbs up for turning TWO! Children will love having their special age celebrated in such a personal way, and parents will appreciate the easy introduction to counting and super-simple math as their toddler gets comfortable with the idea of two as a number. It's a perfect gift for second birthdays and holidays--or anytime your two-year-old is celebrated! And look for the companion book, You're One!, for all the one-year-olds in your life!